Windows 10 like its previous version Windows 8 is equipped with a powerful Disk Management tool. With this don't need any other software to help you in your partition management tasks. In this article we will see how we can a variety of tasks using the Disk Management tool. To launch Disk Management tool, click on the Windows Start icon and search for Disk Management. Click on the "Create and format hard disk partitions". We will start with making a new drive from unallocated memory of hard drive. Actually when I installed I did not care for making my usual 3 drives as I did not expect Windows 10 to be this stable. However, now I have more than 50% of my D drive full and it is time to make a new drive with the unallocated 217 GB of memory I have in my laptop. To start with, right click on the box showing Unallocated memory. Click on "New Simple Volume.." and a new Wizard will open. Click on Next. In the next window it will show you the maximum size available for making a new drive and by default the whole size would be entered in "Simple volume size in MB". Reduce it if you want otherwise press Next. In the next step it would ask you to assign a drive letter or enter a path of empty NTFS folder. By default a drive letter would be assigned which in case you have no idea about should leave it as it is. In the next step choose if you want to format this volume before making a drive out of it or not. If you do want to format in then select the File System type, Allocation unit size and the Volume level. For general users, you should select the option to format the volume and just change the volume label to some name you like, for example as I was going to store only software in this partition so I named it Software. Now click on Next. It will show you all the settings you have chosen. Click on Finish and within a few seconds you will get your new partition. 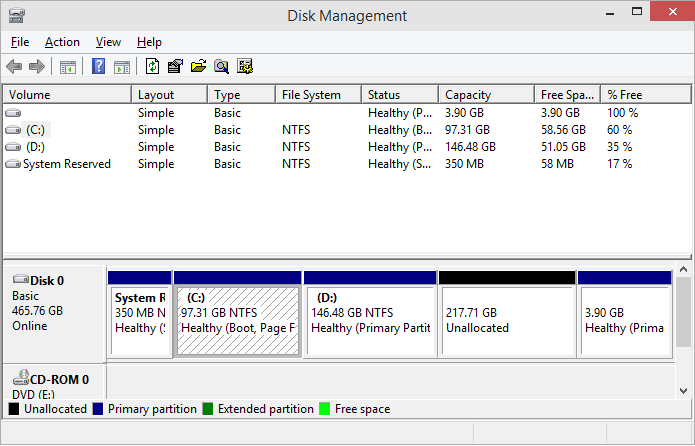 As you can see in the image below, I have a brand new partition. If you have allocated all your hard drive space to different drives and now want to shift space from one drive to another, for example if you C:\ drive is too small to install the software you want then you can use the free memory in from other drive to increase the size of your C:\ drive. To do this open the Disk Management tool. Right click on the drive you want to allocate the space from. Click on "Shrink Volume.. and select the size you want to remove from this drive to be allocated to C:\ drive. You will see this space Unallocated space now. Right click on C:\ drive and select "Extend Volume..". It will now show you the maximum space that can be allocated to C:\ which should be equal to the space you unallocated from your other drive. Click on Next and Finish afterward. Your C:\ space will be increased within a few seconds.